A new-build 33.8 metre explorer motor yacht has been sold by Mexico’s Zarpo Yachts at Italian yard Cantiere delle Marche. 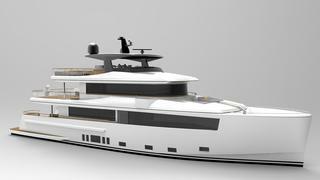 To be built in steel and aluminium by Cantiere delle Marche with delivery scheduled for 2017, she will be the fourth yacht in the yard’s Nauta Air series and is a pan-European project with naval architecture by Dutch designers Vripack along with exterior and interior styling by the famed Italian Nauta Design team. Currently called the Nauta Air 111’ she has been commissioned by an experienced Latin American yachtsman who has a deep interest in underwater ecology and she will accordingly be built with a careful eye on long-range cruising and the ability to remain independent of shore support for extended periods of time. To add to her explorer yacht status, the Nauta Air 111’ will have a bulbous bow and enhanced scantlings in the hull and rudders to cope with icy conditions.